Mobile forms software / paperless data collection makes you more efficient and productive. Collect any type of data in real time using smartphones for QR code / barcode scanning, filling out mobile forms and information look up. 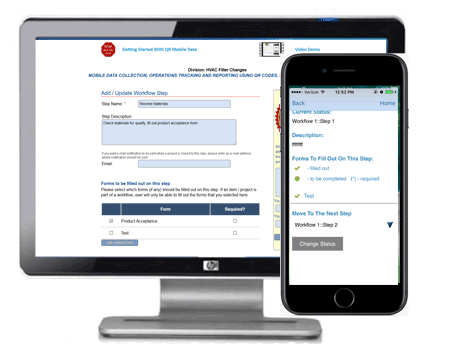 Create custom mobile forms using a simple web interface. Make forms a part of a workflow or use independently. Split large forms into sub-forms by questions categories for logic and easy form completion. Add clarifying text and / or images to the form fields, so that your employees will know exactly how to fill out the form and what part to check. Define form fields data types, if the field is required, and more. Allow users to attach image(s) and capture signatures. Make sure an employee gets correct form(s) to fill out - link mobile forms to the asset groups. Review and update forms any time via a web dashboard, and your employees will get latest forms on their smartphones. Optionally administrator can pre-fill part of the information in the form before pushing it to the mobile devices. Create custom workflows for your business operations and processes via the web interface. Define workflow steps, provide description for your employees. Optionally attach mobile form(s) to the workflow steps. Make forms required or optional. Track production process or business operations on site using a smartphone. Review what was done, move project to the next step, fill out mobile forms. Submit collected data to a centralized cloud location in real time. Review real time projects status, progress, and detailed history of each project via the admin web interface. Get notified when the project moves to the next step. Save money on buying dedicated hardware: use regular smartphones or tablets running iOS or Android to collect data in the field. Identify an object by scanning QR code or barcode with a smartphone, avoid manual entry errors. Employees can select from the list of forms which are relevant to the scanned object. Form design, including categorization of the form parts, clarifying text and images make it easy for the employees to fill out the form. Reduce manual entries and associated errors: an employee can scan data into the form fields using a smartphone, select values from the list or enter data manually when required. All forms have built-in data validation and checks. The work in progress is automatically saved on a smartphone; start, pause and stop at any time and never lose completed data. Collect data without wi-fi or data connection, submit to a centralized storage location when connection is available. Use smartphone as a camera to take photos and attach to the form for visual documentation. GPS location of the form submission is automatically recorded and can be viewed on a map. Field technicians can create pdf report based on the collected data, include images and signature. They can view, print and e-mail report to selected addresses from a smartphone. Create custom fields to hold all necessary information on the business objects you are working with. Information can include specifications, drawings, documentation, instructions and anything else you need. Employees in the field can access all required information by scanning QR code or barcode with a smartphone. Employees with admin access can update information in the field if required, for example, take new measurements, add an image, etc. Employees can access recent records that were submitted for the scanned object, from maintenance to inspections, to conditions assessment, so that they know what was done and what needs to be completed next. Submitted records are stored in a secure cloud, are never misplaced or lost. All authorized users have centralized access to the real time data, on the computers in the office and on the mobile devices in the field. Review projects progress, status, history and completed forms via a web dashboard or export into a delimeted text file. Update submitted form if necessary, or fill out "office only" part. If some information is incomplete an administrator can push a form back to the mobile devices for completion. Create pdf reports based on the submitted forms, include collected data, image(s) and signature. E-mail pdf report within the company or to the client, from the smartphone in the field or from an admin web dashboard. Define pdf look and layout using custom templates. Change template(s) as needed and re-create pdf if necessary. With time tracking module, your employees can easily track time that they spent in the location / working on a specific item or task on a smartphone. Scan in location and / or item. Record start / stop work with one click. Track time without data connection, submit all data when connection becomes available. Built-in error checking to make sure time is recorded correctly. GPS location where the time was entered is recorded automatically, can be viewed on the map via reports. Review and export raw time logs, as well as aggregated time reports by employee / location / item / task or project, or any combination of the above. Import time to your payroll or HR software. Create custom reminders to alert you on the next routine inspection, task to complete, next step in the process and other important events. Attach reminders to the custom fields and receive automatic alerts when the date you specified is approaching, such as warranty expiration date. Specify when to send a reminder, to whom, subject and header text. Create multiple reminders for the same event (e.g. 5 days before, 3 days before and 1 day before). Use QR Mobile Data with QR Inventory for a complete asset and inventory tracking and traceability solution. Track assets and inventory in multiple locations with a smartphone or tablet. Process inventory transactions (such as check in or check out, restocking inventory, take inventory out for a job, return unused inventory, etc.) by scanning QR code or barcode on the item with a smartphone running iOS or android. Results of the transaction are immediately available to all authorized users in real time. Customize every aspect of your inventory management / asset tracking process. Define everything that you want to track, record and report via a web dashboard. Review and export reports on inventory count, locations, transactions history and usage. Filter reports by custom fields you created. 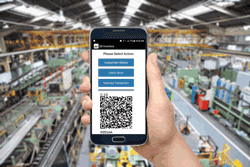 Additional modules to further extend software functionality, from assemblies & kits to purchase orders and invoices management to QR code based ordering.